Intel has announced its first Optane-branded solid state drive. Dubbed the Intel Optane SSD DC P4800X, the chipmaker says the drive is designed to be used as either a storage or caching product in data centers. The P4800X add-in card features a capacity of 375GB, latency of less than 10µs, 4K random read / write IOPS of up to 550,000 / 500,000 and an endurance rating of 12.3 petabytes written (PBW). Intel and Micron jointly announced 3D XPoint, the technology behind Optane, in 2015. The biggest benefit of Optane could have to do with boosting the physical memory of a server. Ars Technical highlights that two-socket Xeon systems can support a total of 3TB of RAM but up to 24TB of Optane while quad-socket systems can accommodate 12TB of traditional RAM and a whopping 48TB of Optane. Standard DRAM would be faster for most workloads but Optane would cost substantially less and offer modestly improved power consumption. In some instances, Intel claims, workloads could even be improved with Optane as the layer that manages it can move data around so it is closer to the processor using it. 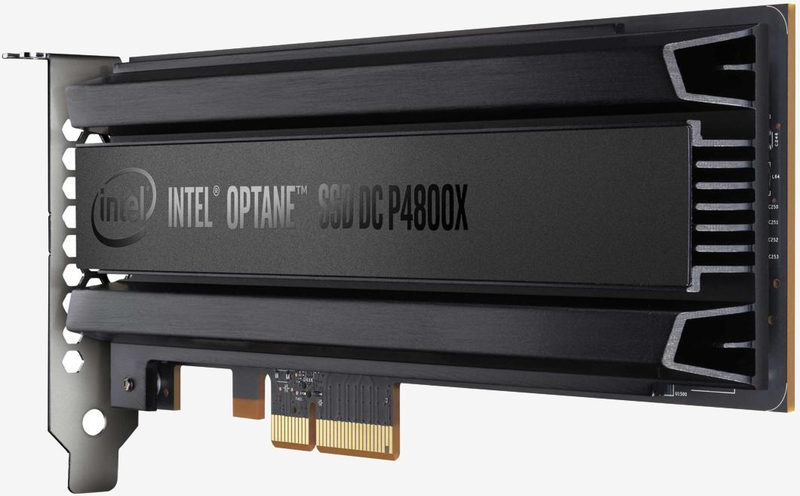 Intel’s Optane SSD DC P4800X is priced at $1,520 with limited availability as of writing. A 750GB PCIe version and a 375GB model in the U.2 form factor are coming in the second quarter with a 1.5TB add-in card and a 750GB U.2 variant expected in the second half of 2017.